Inside Youth Sports: Competing in Sports: You Messed Up, You're Upset—Now What? Competing in Sports: You Messed Up, You're Upset—Now What? At some point, every athlete gets upset at himself, his opponent, or his coach. You may be mad at yourself for making a stupid mistake. Your opponent may have said or done something that is disrespectful. Maybe you feel that your coach doesn’t recognize your ability and has low expectations about your potential to succeed. How you handle these situations is often crucial to your success in sports. When you do get upset, your performance can either fall apart or improve—depending on how you react. You can use emotion or be used by it. Successful athletes manage their emotions to improve their play. They transform negative emotion into a positive action. Why do some athletes play better when they are angry? It’s because these individuals have the ability to channel the energy of their emotions. This emotional energy provides these athletes with the extra force or focus they need to take their play to a higher level. When I was growing up, a tennis player named John McEnroe was infamous for his court tantrums, regularly berating the match’s umpire and often arguing with and glaring at his opponent. Although many fans considered his behavior obnoxious, it was obvious that this man played with more energy and focus when he was mad. He would sometimes search for any opportunity to yell at someone, including himself. Meanwhile, some of his opponents, reacting emotionally to his outbursts, would subsequently fall apart, losing their concentration and focus. How do you best handle upsetting situations? This depends on your individual nature. If you perform better by minimizing emotion or directing it inward, try using relaxation techniques (breathing, imagery, trigger words) to help you dissipate or otherwise control the emotion. If you're more like John McEnroe, then you need to harness the emotion and use it to your advantage. 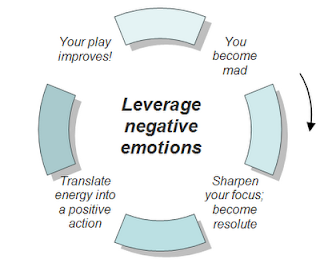 TIP: Emotion can play a huge role in determining a player’s effectiveness. Some players thrive on emotion while others perform better by minimizing it. Try to understand which type of player you are. When you do become angry, take the negative emotion and translate it to a specific positive action. Ideally, two responses should occur when you become upset. First, immediately use the emotion to sharpen your concentration. Instead of losing control of your mental state, become more focused, aware, and fiercely resolute in your determination to succeed. Use the anger to fuel this mental state. Think of your anger squeezing the outer-bands of a target toward its center—compressing more and more energy into the bulls-eye. Second, begin to funnel the power of your negative emotion into a positive, energy-related physical action. For example, you may be the type of player who is a perfectionist. You don't like making avoidable mistakes. While playing offense, you may become mad when you take a bad shot, make a poor pass, or commit a turnover. Instead of hanging your head in dismay or disgust, try to immediately get back and play more intense defense, letting your emotion drive your physical action to a more aggressive (but still controlled) state. With regard to the second point above, sports such as basketball, hockey, and soccer are ones where the action is often continuous. If you miss a shot and hang your head, or otherwise act out, you take yourself out of the play. (And your coach will likely take you out of the game should you compound your original mistake with this behavior.) You must continue to play in the moment. If you miss an easy shot in basketball, pursue the rebound. When you get beat on defense, hustle to recover. I recently talked with a young woman who is a talented point guard on her high school basketball team. On this subject she echoed the above point saying, “Whenever I make a bad mistake, I always try to make up for it by playing better defense.” She also recalled how she reacted when her coach initially suggested to her that if she worked hard she might win a Division II scholarship: “My reaction was ‘I’ll show coach. I’m going to get a Division I scholarship.’” In each case, this girl translated her anger into a positive response. TIP: Coaches recognize and appreciate mature players who both control, and use, their emotions to improve their play. When I was playing youth and high school sports, if I made a mistake I took it very personally and felt really terrible about letting the team down. However, the fact that I reacted so strongly fueled my desire to work even harder to follow-up with something great that would make everyone over look the fact that I had made an error. Hi Caitlin... 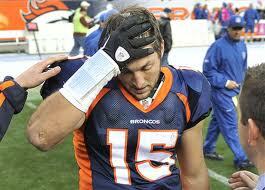 I can relate to your feeling of letting down the team! I expect that each of us has our own unique mix of motivational triggers for our responses to screwups. It can be letting down someone else (your teamates, coach, or parents), being embarassed about a public mistake, or feeling that you are playing below your innate ability. I'm sure the sports psychologists out there can expand on this theme. For myself, even when I'm playing a sport in a recreational setting (e.g., Coed volleyball at the Y), I still get a little upset when the quality of my play falls below a certain level. In those moments, I find myself bearing down and focusing my concentration in an effort to play more in line with what I perceive my abilities to be. Like you, I use my emotion to help fuel my response.